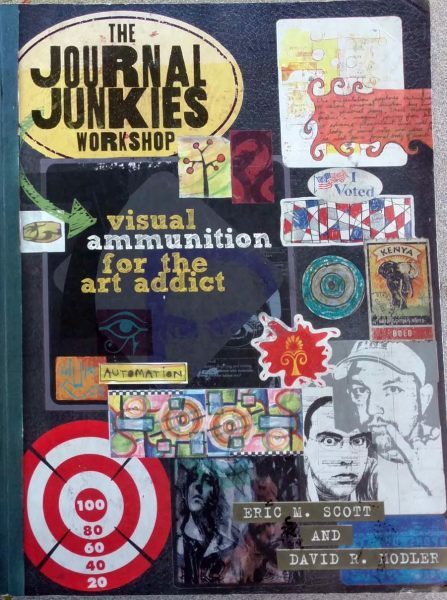 On October 28, 2005, I had the pleasure of attending a workshop hosted by the “Journal Fodder Junkies,” Eric Scott and David Modler. It literally changed my life. I had never heard of visual journaling, but it was love at first sight. Since that day, I have consistently kept a visual journal. I am currently working on my 11th volume but have also produced two collaborative journals, which I lovingly refer to as the “Tiny Tradables” and two works I consider more under the “Altered Book” category. That is 14 books I’ve created in 13 years! It is a passion I have tried to pass along to my high school students. I require my sophomore through senior level art students to keep a visual journal. It is 40% of their grade. Some students struggle with the discipline of keeping up with the sheer quantity of pages required (3-4 pages per week), but most learn to use it as a tool to try out ideas, reflect on events, and express themselves in a space that feels safe, that they have ownership and control over. 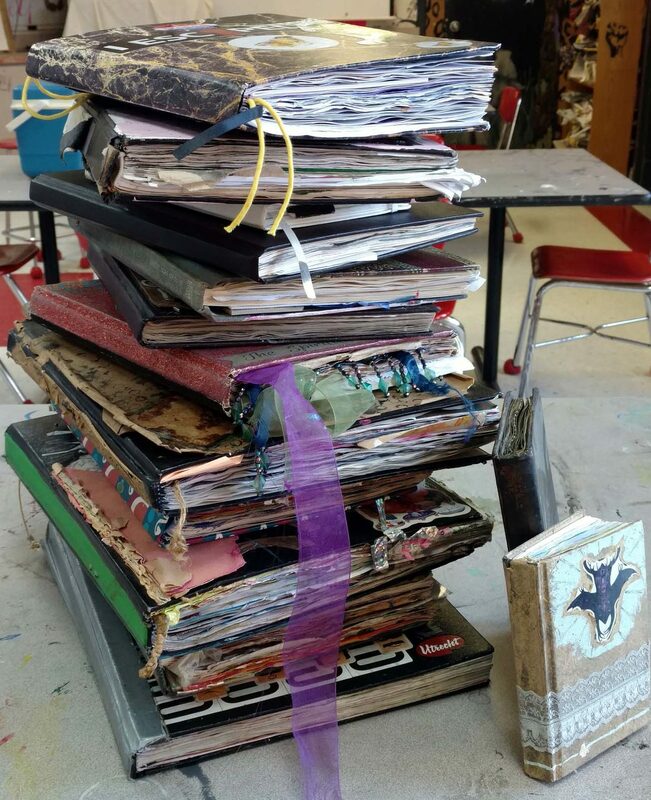 Several students have come back to visit from college and are proud to report that they are still visual journaling and cherish their old books as artifacts of the high school experience that are much more valuable than any yearbook could ever be. 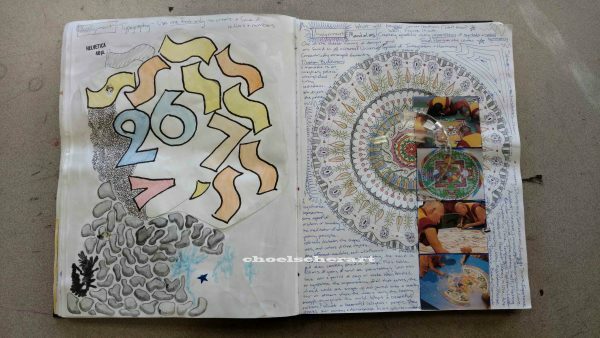 So what is a visual journal? It is a melding of the visual and the verbal. It is a thinking space for those that don’t always think in words. Did you doodle in math class? Then this is probably the approach for you. Everyone’s approach is different, but it is a place to layer ephemera (like ticket stubs or magazine clippings) over top of notes from meetings and to do lists, as well as a place to try out new art approaches. My particular approach is non linear. I return to pages again and again, adding related ideas and objects that just seem to visually match what was already there. This creates a rich, layered quality to the pages that really appeals to me. The Journal Fodder Junkies express it well in their book, The Journal Fodder Junkies Workshop: Visual Ammunition for the Art Addict. North Light Books, 2010. “For us, the visual journal is truly the everything book. We find that our journals are an extension of ourselves and that they become a valuable piece of documentation for our lives. It is a personal as well as professional tool, and when you look through our journals, you are just as likely to find daily reminders and notes from meetings as you are to find personal artwork and self-reflection. I can’t agree more. The visual journal is a place to grow and reflect and therefore accelerate that growth, where we learn to allow ourselves to open up. With time, the artist becomes more comfortable as we realize we are in control of who can be a witness, if anyone. We are not producing art for anyone but ourselves. There is no pressure. It is art for our own eyes and becomes more about the process than the product. We learn to think by making art. We learn to process by producing. That is true art! When we can let go of all the pretense and just express and experiment without worry over what someone else will think. This is a spread from my very first visual journal. This volume took almost three years, as I was still learning to incorporate the practice into my daily life, but it is also the most intricate. Here you can see me processing through ideas for two separate lesson plans; one on typography and one on mandalas. I can look back at some of my first visual journals and remember who I was then; what I was focused on learning and overcoming, what was important to me. It gives me perspective. It helps to calm anxiety as it makes long term goals seem more achievable. I can look back and see how far I’ve come. I can see all the things I have accomplished and all the things that just don’t matter to me anymore. It’s a really fascinating and helpful exercise if done consistently. This page was produced at a time when my son and I were reading Lord of the Rings together and becoming obsessed with the card game Magic: The Gathering. I listen to music a lot while making art. Sometimes the lyrics hit me as quite profound. The quote is from a hip hop song by Chance the Rapper. 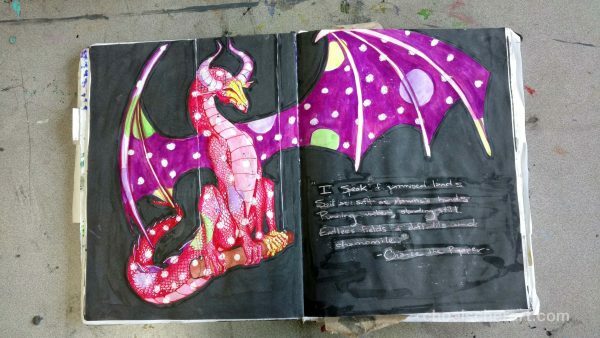 If you’d like to look through my visual journals, you can, page-by-page! Click on the visual journal tab at the top of my website and click on the book you’d like to explore. Click on the cover once more and arrows will appear to the right and left that will allow you to flip through each of them like a real book. Yes, ALL 13 books are available in their entirety. Please feel free to leave comments and let me know what you think or just that you were there and appreciated what you saw. Also, I’m thinking of making some video tours of my visual journals for my YouTube channel. What do you think? Would people be interested in watching me flip through and explain what I was thinking and going for with each page? Like I said, I’ve been teaching visual journaling to my high school students for about ten years, so if you want me to elaborate on anything, let me know. I can do additional posts on any number of details regarding the visual journaling subject, and videos as well. I just need to know what you all would like to know and see. Next post: Exhibit Opening This Friday! Awesome! I realize that I made one without notice what I was doing! Hahaha! I need to finish it… and then I’m inspired by you to do one per year! Let’s see if I can make it! I’m planing about to record a video too! Feel free to follow me on YT too if you want! I’m that girl that was stalking your channel from the begining! Hahaha! That is exciting. I will definitely keep an eye out for your videos and head on over to subscribe.